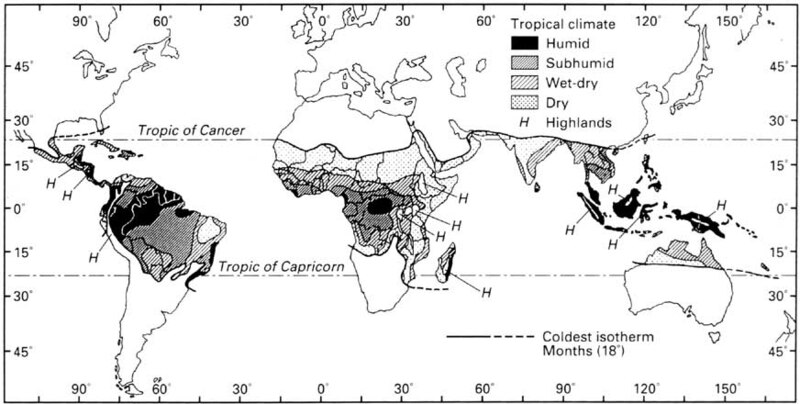 The humid tropical bioclimate occupies a vast region of the world (Fig. 3) and contains parts of as many as 60 countries that are partly or completely located within this bioclimate. By the year 2000, as much as 33% of the world population, or about 2 billion inhabitants, will be living in the humid tropics (Bonell et al., 1993). NRC (1993a) estimated that relative distribution of the humid tropics includes about 45% in the Americas, 30% in Africa, 25% in Asia, and only a small fraction in the Oceania and Pacific islands. Humid tropics are the climatic regions where mean monthly temperatures are consistently high and exceed 18�C throughout the year, and where rainfall exceeds evapotranspiration for at least 270 days in a year (Salati et al., 1983; CGIAR, 1990a; Lugo and Brown, 1991). Detailed analysis of forested bioclimates in the tropics is given by Holdridge (1967). The annual rainfall ranges from 1500 to 2500 mm, with some regions receiving rainfall in excess of 6000 mm per annum. The mean rainfall in the humid tropics is about three times the world average. On the basis of moisture regime and temperature, the humid tropics are also termed "warm humid tropics". It is the amount and distribution of rainfall rather than variations in the temperature that determine the seasons (e.g., rainy season vs. dry season). - a virtually closed ecosystem for most nutrients and water within the mature or high TRF. Forest conversion and land development. disposal of large biomass. Acid soils, low nutrient reserves, especially P. Al, and Mn toxicity, Ca deficiency, accelerated erosion, soil compaction, leaching losses, weed and pest incidence, grain drying and storage. Pre-montane forest 18-25 1500-4000 Forest conversion methods mechanized on fragile soils on undulating to steep terrains, mass wastage, and accelerated soil erosion and land degradation, acid soils of low fertility, nutrient imbalance (e.g., Al and Mn toxicity, P deficiency), weed and pest incidence. crop drying. The principal ecological constraints of the TRF ecosystem for intensive agricultural land use are shown in Table 1. These constraints are primarily biophysical due to climate, vegetation, and land characteristics. Oxisols: Oxisols are the predominant soils of the humid tropics and occupy 35.3% of the total land area. These are old, highly weathered, acidic, permeable, and well-drained soils and occur in regions without a marked dry season. Clay minerals are predominantly kaolinitic, and occur with or without plinthite or laterite. The TRF is the climax vegetation of these soils. The occurrence of savanna-type vegetation in Oxisols may be due to degradation of TRF and soil resources. Ultisols: These soils are similar to Oxisols but are relatively less weathered and younger, and occupy 27.7% of the humid tropics. These soils occur in regions with isotherms between 25� and 28�C, with annual rainfall between 1500 and 2000 mm, and in warm humid climates with a marked seasonal deficit of rainfall. The knolinitic clay minerals are relatively more active, and Ultisols have relatively higher nutrient reserves and effective cation exchange capacity than Oxisols. Inceptisols: These are young soils, but they have distinct horizonation and are very fertile. They occupy about 15.2% of the land area in the humid tropics. Three principal types of Inceptisols occur in the humid tropics. Aquepts are alluvial soils formed along the flood plains and occupy 120 million ha or 8.0% of the humid tropics. Andepts are soils of volcanic origin, young, extremely fertile, and occupy only 12 million ha or 0.8% of the humid tropics. Tropepts occur in warm humid climates, have base saturation of about 50%, contain relatively high amounts of soil organic carbon (SOC) ranging from 8 to 12 kg/m2/m depth (Van Wambeke, 1992), and occupy 94 million ha or 6.3% of the humid tropics. Entisols: These are also young soils but without distinct horizonation. These soils are generally featureless because of the shorter time they have had to form distinct characteristics or because they have been formed on relatively inert parent material. There are three distinct suborders within Entisols. The most predominant sub-order is Psamments. These are coarse textured soils with high permeability. low water holding capacity, and low nutrient reserves. Psamments occupy about 90 million ha or 6.0% of the humid tropics. Fluvents are formed along flood plains and are recent alluvial deposits. These soils occupy about 50 million ha or 3.4% of the humid tropics. The Lithic sub-order or shallow and rocky soils occupy 72 million ha or 4.8% of the humid tropics. Lithic soils are marginal for agricultural production. Together, Entisols cover about 14.2% of the humid tropics. Alfisols: These soils occur in the semi-humid and sub-humid tropics in cool to hot humid areas with a prolonged dry season. Alfisols are less weathered in comparison with Oxisols and Ultisols but are more strongly weathered than Inceptisols. In general, Alfisols are fertile and productive soils but have the severe soil physical limitations of crusting. compaction, erosion, and drought stress during the dry season. Alfisols occupy 3.6% of the land area and are of relatively minor importance in the humid tropics. Histosols: These soils have relatively high organic matter content, with carbon content ranging from 12% to 18% in the surface horizon. These soils are formed in wet conditions. With good water management, they can be highly productive. These soils occupy only 27 million ha or less than 2% of the humid tropics. Spodosols: These soils are characterized by a sub-surface horizon (illuvial) with relatively high organic matter content along with high concentrations of aluminum and iron oxides. The surface horizon is usually leached (eluvial) and is often light (albic) in color. Spodosols occupy only 19 million ha or about 1% of the humid tropics. Other Soils: Mollisols and Vertisols also occur in the humid tropics. Mollisols occupy 7 million ha (0.5%) and Vertisols 5 million ha (0.3%). Mollisols are highly productive, dark-colored, and are agriculturally important soils. The surface horizon is characterized by high soil organic matter content and a well-defined granular or crumb structure, and responds favorably to inputs. In comparison, Vertisols are also dark-colored soils, but they contain a high content of expanding-type clay minerals. On drying, these soils develop wide and deep cracks and have poor trafficability. Soil-related constraints to crop production for different soil orders are shown in Table 3. Oxisols and Ultisols together cover about 63%] of the total land area of the humid tropics. These soils are highly acidic (pH 4 to 5), often contain toxic concentrations of Al and Mn, and are usually deficient in essential plant nutrients (e.g., N. P. Ca). Liming and frequent additions of phosphorus are essential to improving agronomic productivity. Once nutritional constraints are alleviated, decline in soil structure can also be a problem under intensive mechanized agriculture. Deterioration in soil structure leads to crusting, surface and sub-soil compaction, surface runoff, and accelerated erosion. Alfisols are relatively more productive soils with favorable soil fertility and nutritional properties. However, Alfisols have more severe soil physical constraints than Oxisols and Ultisols. Alfisols are severely constrained by rapid decline in soil structure, crusting, compaction, hard setting, high losses due to surface runoff, and accelerated soil erosion. Highly productive soils of the humid tropics with only slight or moderate constraints to intensive agriculture are Inceptisols, Histosols, and Mollisols. These are young and fertile soils, and those of alluvial and volcanic origin and Mollisols are extremely productive. However, the distribution of these soils is extremely limited, covering only 17.5% of the area in the humid tropics. Although these soils are less prone to soil physical and nutritional problems, mismanagement and inappropriate land-use systems can lead to compaction, erosion, and nutrient depletion. The term "farming system" implies a resource management strategy involving integrated management of crops, trees, and animals, along with labor and capital to optimize the use of land resources. Primary land resources involved are climate, vegetation, soil, and water. Types of major farming systems prevalent in the humid tropics are outlined in Fig. 4, and briefly described in Table 4. - small farms of 1 to 2 ha that can be managed by manual operations performed by the farm family. Traditional systems are ecologically viable and socially acceptable as long as there is enough land for lengthy (10 20 years) restorative fallow and expectations for yield and standard of living are not too high. In fact, introduction of alternative farming systems in some ecologically sensitive regions of the humid tropics has met with only limited success. In contrast with traditional systems of shifting cultivation, some purchased inputs are used in semi-commercial farming systems. It is common to use chemical fertilizers on tree crops. Most management inputs are directed to cash crops rather than food crops. In addition to chemical fertilizers soil fertility is also maintained through application of organic manners involving compost, household wastes. and crop residue mulches. - timber (e.g., teak (Tectona indica), Gmelina (Gmelina arborea). cassia (Cassia siamea)). The success of plantation crops depends on management. The chances of sustaining production in tree-based systems are high with science-based inputs. However, mismanagement of tree crops can also cause soil and environmental degradation. Food crops are often grown in association with tree crops (Harwood, 1987) to minimize the risks of soil degradation during the initial phases of development and to augment income. Large-scale ranching and livestock production is an important commercial system for the humid tropical regions of Central and South America (Hecht, 1982; Hecht et al., 1988; Hecht and Cockburn, 1989). These systems have been successful wherever stocking rates have been kept low and improved pasture species have been grown with recommended inputs. Because most soils are low in inherent soil fertility, excessive and uncontrolled grazing can lead to compaction and erosion, and degradation of pasture to weeds and unpalatable species. Attempts at introducing large-scale and commercial crop production systems in the humid tropics have met with only limited success (Lal, 1987b). There are several climatic limitations to grain crop production (e.g., high relative humidity, low levels of radiation during the growing season, high incidence of diseases and pests, high storage losses). Mechanized harvesting is also inefficient and causes severe soil compaction. The total area degraded by different soil degradative processes in the world is estimated at about 2 billion ha (WRI, 1992 93). The largest area of degraded soil is in Asia (38%) and Africa (27%). Most of this degradation is caused by accelerated erosion, which is a serious problem in the humid tropics. Jansson (1988) reported that high sediment yields are observed from river basins draining humid tropical climate regions (Af in Koppen's classification). High sediment yields are reported from humid regions of Costa Rica, Java, Malaysia, Panama, Papua New Guinea, Australia, Philippines, and Thailand. High rates of soil degradation are observed in the humid tropical regions of Central America, Africa, and Asia (WRI, 1992 93; Oldeman, 1994). Severe water erosion is extensive in the humid regions of southeast Asia, including Burma, Thailand, Malaysia, and Indonesia; many islands in the Pacific and Oceania; along the mountains of the Pacific coast in Central America, including southeastern Mexico, Honduras, Nicaragua, and Costa Rica; and in the drastically disturbed regions of the Amazon Basin. Physical Degradation: Soil physical degradation is related to decline in soil structure leading to crusting. compaction, excessive overland flow, and accelerated erosion (Plate 6). Estimates of the extent of physical degradation have also been made by Oldeman (1994). Depending on soil properties and terrain characteristics, sheet and rill erosion can also change to gully erosion and other forms of mass movement. High rates of soil erosion by water are reported from several countries in the humid tropics (Table 5). High soil temperature, exceeding 40�C at 5 cm depth for 4 to 6 hours a day, is another factor that accentuates soil physical degradation by affecting soil structure and the rate of several processes within the soil. Physical degradation is also aggravated by drastic changes in energy balance and hydrological cycle by deforestation and intensive agricultural activities. Chemical Degradation: Disruption in cycles of C, N. P. S. and other minerals leads to chemical degradation of the soil. The most important form of chemical degradation is acidification due to depletion of bases (Ca, Mg, K) and accumulation of H and Al on the exchange complex. Depletion in soil reserves of plant nutrients (N. P, K, Zn, S) is another cause of chemical degradation. The effects of chemical degradation are drastic on Oxisols and Ultisols which have low inherent soil fertility. Biological Degradation: Reduction in the quantity and quality of soil organic matter, and biotic activity and species diversity of soil fauna are important forms of biological degradation observed in the humid tropics. Soil fauna play an important role in nutrient cycling and in maintaining soil structure. Land-use and soil and crop management systems with adverse effects on soil fauna accentuate biological degradation. Biological degradation also refers to change in the climax vegetation. Vast areas of the humid tropics previously covered with TRF are now infested with spear grass (Plate 7).